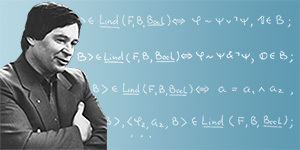 Academician Ershov Yury Leonidovich is an eminent scientist in the field of algebra and mathematical logic who made a fundamental contribution to the development of this scientific branch of mathematics. Yu.L.Ershov is the author of outstanding results in the description of elementary field theories. He found links with the theory of profinite groups and the theory of normalized fields. On this basis, he created powerful methods to prove the solubility of the elementary field theories that made it possible, on the basis of theoretical modelling methods, to discover new classes of fields with solvable elementary theories. Yu.L.Ershov and his disciples have made a great contribution to the formative stage and modern-day development of the theory of constructive models. Currently, he conducts interesting investigations into the theory of admissible sets. He solved problems of constructibility of models in infinite potencies concerning admissible fragments. Yu.L.Ershov has made a large contribution to the theory of denotational semantics of programs where he constructed and studied topological A-spaces that have more natural structure. World-wide recognized findings of Yu.L.Ershov include those on solubility and insolubility of elementary theories for various classes of groups, Boolean algebras, fields, and alternative structures that found their way to numerous applications in mathematical logic. Particularly, one of his results in indexing theory was the constructing of a category of spaces, by means of which one can construct a consistent model of typeless lambda-calculation that is more convenient in many aspects than Scott topology. Yu.L.Ershov is a recognized leader of the Siberian school of algebra and logic that has been created by academician A.I.Maltsev, his teacher. As of now, this school includes more than 40 doctors and 100 candidates of sciences. The Siberian logic school headed by academician Yu.L.Ershov is at the leading positions in the modern-day mathematical logic. Supervised by academician Yu.L.Ershov, the Siberian logic school conducts a great scientific-and-organizational and teaching work in carrying out of All-Russia and International scientific conferences, seminars, in work with students and post-graduate students. With this school, the basic educational courses on mathematical logic, theory of algorithms, and applied logic are organized at Novosibirsk State University, as well as a whole spectrum of specialty courses. For almost ten years, academician Yu.L.Ershov headed the S.L.Sobolev Institute of Mathematics of SB RAS. During eight years he was the rector of one of the best institutions in Russian higher education, the Novosibirsk State University. He conducted a great scientific-and-organizational work as the director of the State Scientific Research Institute of Discrete Mathematics and Computer Science of the Ministry of Education of the Russian Federation. He headed the sub-faculty of algebra and mathematical logic of NSU; he was the dean of mechanico-mathematical faculty of Novosibirsk State University. Yu.L.Ershov has published more than 300 learned works, 12 monographs, six of which are translated abroad. They have got a high estimate among the professionals. Yu.L.Ershov is the editor-in-chief in the editorial board of «Algebra and Logic» journal and in a series of monographs. His scientific merits have been pointed out by the State Premium of the Russian Federation, by the Premium of the Government of the Russian Federation. He is awarded by Order of Merit for the Fatherland of the IV and III degree. * Source: Lauryeaty Dyemidovskoi pryemii 2013 goda / po matyerialam pryess-tsyentra RAN // Nauka v Sibiri. - 2013. - N 45 (14 noyabrya). Updated: Wed Feb 27 14:46:32 2019. Size: 10,150 bytes.